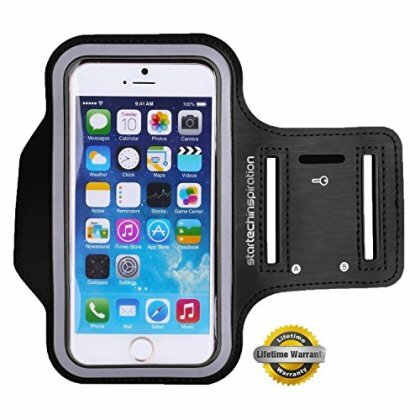 A SUPER SOFT PROTECTIVE SCREEN COVER maintains full touch screen functionality for touch enabled devices and Cellular, Wi-Fi and Bluetooth signals are unaffected so your device can still communicate with external devices such as heart rate monitors, Nike+ sport kits and other activity trackers. A REFLECTIVE SILVER TRIM provides additional safety at night and a SPECIAL KEY HOLDER SLOT is also included to take a regular size house, apartment or locker key. END YOUR EXERCISE BOREDOM NOW!!! Listen to your favorite music, audio book or use a fitness app as you workout wearing your cool, stylish PRO SPORT ARMBAND. Can be used for many different sports, gym and general activities - not just for running! DON'T SETTLE FOR BASICS, GO PRO! Made from ADVANCED FORMULA PREMIUM NEOPRENE rather than Lycra, it is sweat resistant and strong yet incredibly flexible and expandable - an iPhone will fit in it with a slim case still on! No need for additional bulky pockets either as you can even keep cash, a credit card, ID card or swipe card behind your device too! Lifetime Warranty - Just Send Your Defect Back And Order Comfirmation Back For An Exchange.